What’s the difference between skateboard shoes and any other shoe? 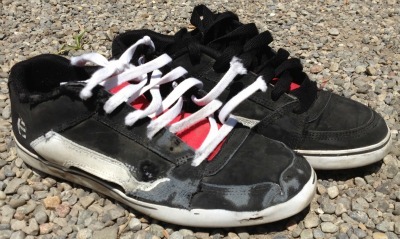 Normal shoes will crumble under the wear and tear of skateboarding. The sandpaper griptape on a skateboard will shred them like a grater on soft cheese. It will not be pretty. In order to grip a skateboard that has no handles the entire top surface is covered in a layer of grippy sandpaper called griptape. Griptape is sandpaper that has strong adhesive on one side. It is applied to the skateboard when it is purchased. The grip tape is really rough and lets you shoes really grip and hold on to the skateboard. This grip is what allows you to do all the skateboard tricks you see. Without it skateboarding is very difficult. This sandpaper is rough and it wears down shoes quickly. When you do the tricks your feet rub and push against the grip. The wear that is caused is pretty high. You need durable shoes that can stand up to the roughness of sand paper. The rough wear spots caused by skateboarding is called "ollie burn". It looks like your shoe was worn down or burned away in the outer toe area. the high wear will eventually go right through the shoe. Leaving holes and torn laces. With this kind of wear on the shoes they need to be made to stand up differently than regular shoes. Here is the difference between skateboard shoes and other shoes and some tips on what to look for in a skateboard shoe. Skateboard shoes are made with hard rubber soles and thick and tough uppers to handle the wear. Along with durability you need to be able to feel the skateboard. Skateboard shoes are designed with flat and flexible soles that give you a consistent board feel. Skateboard shoes need to be really tough and have flat soles. For this reason they are not really flashy or gimmicky looking. They are typically plain looking compared to fancy basketball shoes. When I started skateboarding in the early 90’s the skateboard shoes companies were not huge. I think that because they were small they had pretty good quality products. The shoes didn’t have that mass produced cheapness that we are all familiar with. Many brands that make skateboard shoes today have stuck to that mantra. Some haven’t. I bought a pair of shoes by a company that I have known since the early 90’s. I expected the same great quality that I had always gotten. I have had at least ten pairs of their shoes up until now. I was disappointed almost immediately. These shoes were not what I had come to expect. They hurt my feet. The sole was thin and not supportive.They didn’t have easily removable insoles like they used to. I guess this company started making cheaper mass produced shoes but they sold them at a skateshop that usually has better quality stuff. I was expecting a higher quality shoe than what I purchased. The lesson I learned is that you need to be careful about quality even in the brands and vendors you used to trust.Sad but true. Growth into the mainstream affects the quality of a long standing brand. How long do skateboard shoes last? I like doing flip tricks on my skateboard. This kind of trick involves sliding your feet all over the skateboard. Your shoes wear out much quicker than other types of skateboarding. For this reason I go through shoes pretty quickly. When I skate everyday in the summer I typically will go through two pairs of shoes just for skateboarding. I have a few things I do to stretch the use of these shoes and save as much money as I can. Flip tricks will eat away at the top of your shoes and the laces take the most wear. Shoe laces are not durable. They will rip under very little wear. For this reason good skate shoes will be designed with some sort of protection for your laces. They will also come with a second set of shoe laces. Usually in a different colour. I always need to reinforce my laces with Shoe Goo. It’s that or I buy skate shoes that have hidden lace loops or a flap that protects the laces. I know my shoes won’t last very long so I buy discount skateboard shoes whenever I can. I look for last pair deals or buy the ugly shoes because they will get trashed anyway. I figure I am just skateboarding in them so who cares how they look. (within reason). When I was younger I would try and stretch my money a little too far. I would by discount shoes that weren’t the right size. This was a bad move. I bought shoes that were too small and I would skate them until I had blisters on my heels. This was a dumb move on my part. My feet were beat all to hell on I couldn’t skate at all until they were healed. Buy shoes that are on sale but get the right size. Don’t pay for it like I did. get the right size. There is a way to slow down the affects of ollie burn. I use liquid ribber on the worn down spots. Shoe Goo is brand of liquid rubber. It is easy to apply the liquid rubber to protect those shoes. I place it on the worn areas to give life to the shoes and save money. I do this right away while the shoes are new. That way they are protected from the beginning. I will usually skate the new shoes for one session to leave wear marks on the shoes. I then apply the shoe goo to the affected areas. That is how I know where the shoe will wear. This keeps the shoes protected right away. They last quite a bit longer with the added protection and at a fraction of the cost of buying a new shoe. Yes I love using the shoe goo. That’s for sure. Get proper fitting skateboard shoes that will stand up to the abuse of skateboarding. Get some shoe goo to make those shoes last longer. Do that and your shoes will last and you can spend more money on your actual skateboard.